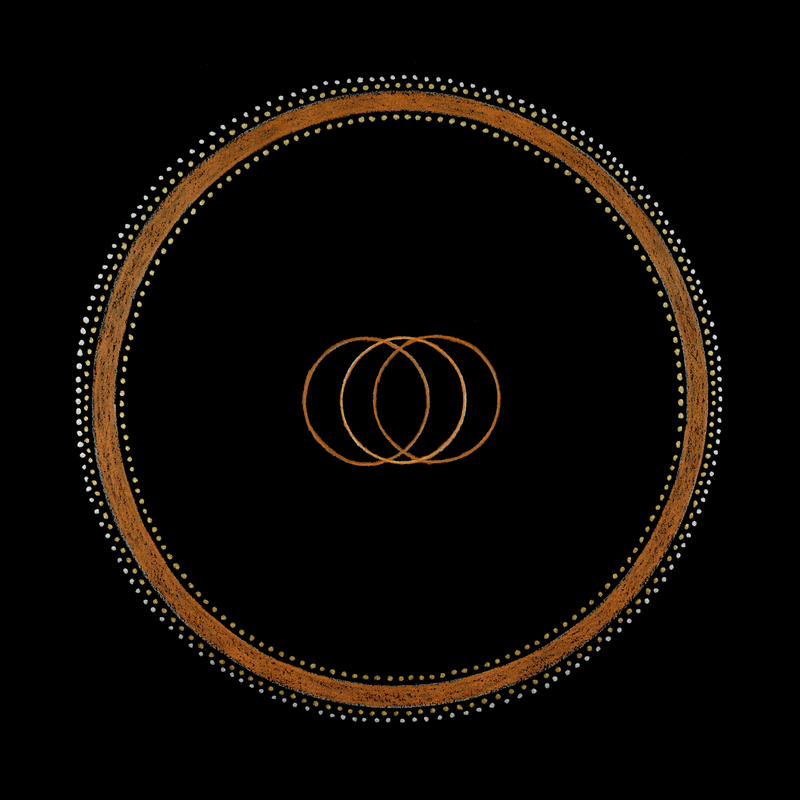 The Seed of Life is made up of seven interlocking circles that represent the six “aspects of our solar system” as circles that have divided from the central one, which is the Sun (1+6=7). It is often referred to as the “Genesis Pattern” associated with the creation story in Genesis based on the six days of creation and the seventh day of rest. Since seven “heavenly bodies/lamps” could be seen with the naked eye the number seven became elevated. This marks the beginning of astronomical time. These “heavenly bodies” were actually the planets Mercury, Jupiter, Mars, Venus and Saturn plus the Sun and Moon. Together they were known as the “Seven Sages” or wise ones. When the Romans created the Julian calendar in 46 BCE they named the seven days of the week for each of the seven sages. Sunday is the Sun’s day. Sol is the Latin word for Sun. Since the Sun is the primary source of energy and is the center point of our solar system it can be seen as separate from all others planets that rotate around it. This can be seen as (1+6=7), the sun is one. The number six, (6) also known as a hexad is seen as a symbol of harmony and the union of two triads, which brings balance. Sun worship was central to many cultures throughout the world. Solar deities such as the Egyptian RA, Greek Helios, Incan Inti, or Lakota Wi, are but a fraction of the names of deities associated with the Sun. Our solar plexus represents our internal source of energy and personal sense of how to use our power. This is where our desires are fed to take action and our willpower is tested. The light of the solar plexus also casts shadows within the self. The greatest gifts can be found hiding behind our fears. This chakra goes into the darkness of the self to retrieve the wisdom born of fire. By making peace within the darkness one can more fully stand in their light. Message: Power provides the ability to create, destroy and to nurture. To be at peace with the concept of power is to know when to create, when to destroy when to nurture and when to rest. You alone have the ability to choose. Be open to this power that is growing within you. Learn how to use this power wisely as you plant seeds for your future. The solar plexus chakra is located in the stomach area and is connected to the digestive system. This is a place of vitality, confidence, courage, integrity, joy and sweetness. It represents the world of the mythic and the archetype of the hummingbird. Hummingbirds and dragonflies remind us that nothing is impossible when we see our life as sacred fairytales that we get to rewrite. 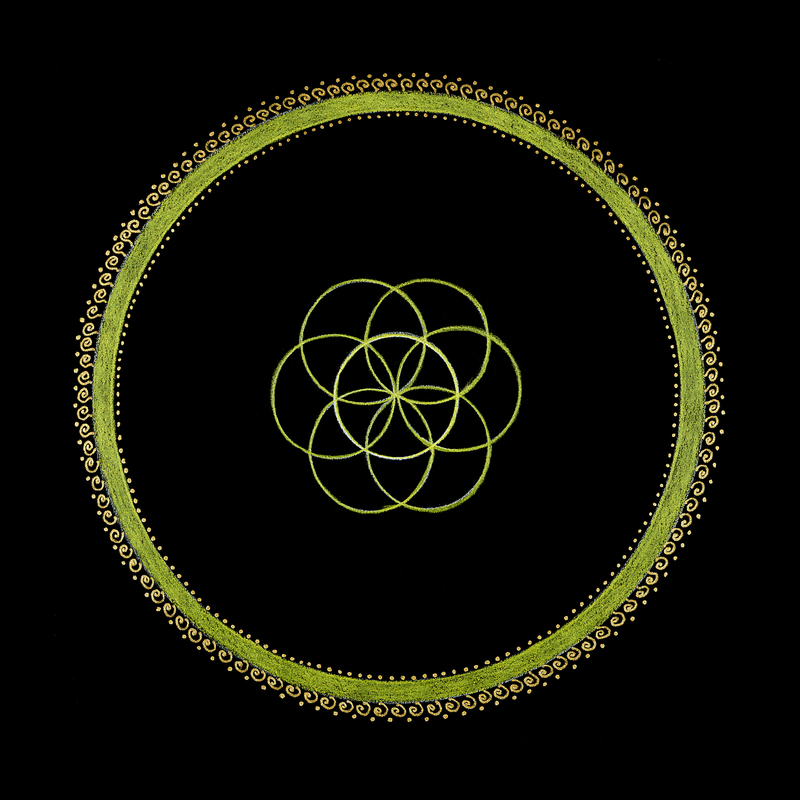 In sacred geometry, this is the seed of life that holds our hidden potential. Its element is fire and its belief is forged in the Hindu tradition of tending the eternal Agni fire. The light of the solar plexus casts shadows within the self. The greatest gifts can be found hiding behind our fear. This chakra goes into the darkness of the self to retrieve the wisdom born of fire. By making peace within the darkness one can more fully stand in their light. The Fruit of Life is the culmination of growth that provides the “gift or fruit” born through sacred order. This sense of order was defined by human observation of the cosmos. Its core is the central, unifying “one”, the sun as the Container of Life. It holds the Seed of Life representing the six planets in our solar system and the Flower of Life that symbolizes the twelve aspects of the Zodiac seen in the stars. Together they represent cosmic order from which the Fruit of Life is born. Two “rounds” of 18 and 24 circles are added onto the Flower of Life to form an interlocking symbol of sixty-one total circles that creates the Fruit of Life. The first “round” of 18 circles represents a Saros, which is an 18-year, lunar or solar, eclipse cycle. Lunar and solar eclipses mirror each other every nine years in the exact location, this is called a Sar or half of a Saros. 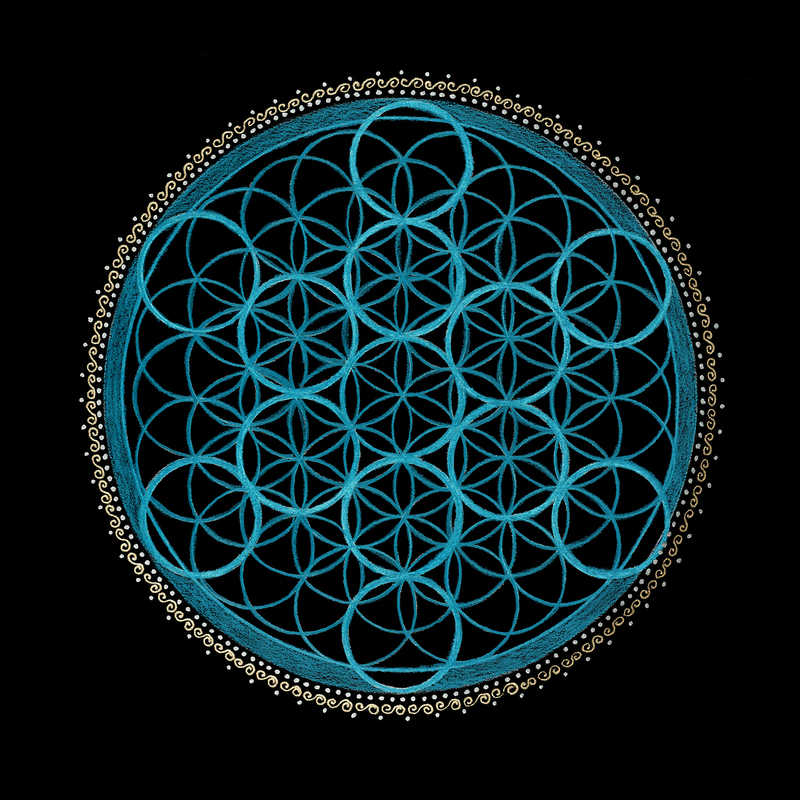 By adding these 18 circles to the 19 circles in the Flower of Life a total of 37 circles appear. When combined, the central circle becomes the “central one,” therefore 36 circles revolve around the central “Sun”. The 36 weeks in a solar year equates to nine months, the approximate time for human life to gestate. The “Sun” can now be seen as the “Child”. The second round of 24 circles represents a 24-hour day. When you combine both rounds with the flower of life you have 60 total circles (1)+(6+12+18+24=60) rotating around the central “one” represents the 60 minutes in one hour or 60 seconds within one minute. The actual “Fruit of Life” pattern is revealed in the 13 independent circles. These 13 circles represent each of the four seasons (spring, summer, fall, winter) within a 52-week solar year (13 x 4 = 52), as well as the 13 moon cycles within a lunar year. The Fruit of Life is symbolic of the life-giving aspects of both the Sun and Moon. The Fruit of Life honors the organizing principles of creation and the fruits of our labor. Many stories and prophecies have been inspired by the cosmic dance between the Sun, Moon and Earth. One of mankind’s greatest gifts was the creation of calendars and time, which brought order to agriculture. Message: It is time to get yourself organized and prepared. Become aware of your surroundings and identify what needs to shift to help you move forward. Share your insights with someone who can help you create this new reality.